Excellent for skin, heart, nerves, hormones & more! 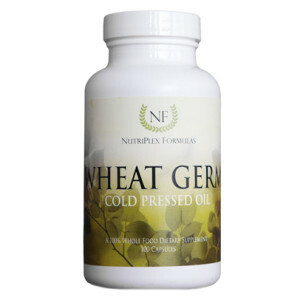 Wheat Germ Oil (oil that is cold-pressed without the use of hexane or other toxic chemicals). In addition to the unique properties, synergists and cofactors of this food, each serving provides the following nutrients contained within the above food-nutrient blend (not as isolates): Vitamin E; and the following Essential Fatty Acids: Oleic (Omega 9), Linoleum (Omega 6), and Linolenic (Omega 3). Inactive Ingredients: Gelatin (Bovine) and Glycerine. 1-2 capsules daily, or as directed by a healthcare professional. Wheat Germ Oil contains essential fatty acids and is a natural food source of vitamin E and selenium. Deficiencies in both vitamin E and selenium may lead to skin problems, low immunity, heart conditions and hormonal imbalances. Wheat Germ Oil, especially due to its antioxidant protection, is an excellent daily addition to the diet, both due to its ability to protect cells and work synergistically in protecting other vitamin complexes. In cases of nervous system problems, cardiac health and skin disorders, vitamin E and selenium in wheat germ are beneficial. Because the hormonal system is fed by essential fatty acids and lipids, Wheat Germ Oil is also beneficial for physiology related to glandular (especially sexual) health and function.